No matter for which option you will decide-beginning by the ARGISOL - Kit with complete planning and structural calculations until turn-key hand-over - our ARGISOL Team will support you individually by realisation of your demands. One decisive advantage of ICF constructions are low wage costs: they are only 1/3 in comparasion to traditional ways of building. To build with ARGISOL® is child's play: due to the nubs even a layman is able to build in a truly aligned and plumb way. Furthermore, unfilled elements are very light and therefore make heavy building work much easier. ARGISOL® shuttering elements can be put up and filled in no time in comparision with brick walls. Last but not least, the ARGISOL® building system is more cost-saving than traditional ways of building. Building in a traditional way means that high demands on heat protection can only be met by using additional heat insulation. By using double-sided Neopor® shuttering ARGISOL® allows you to achieve an incredible U-result of 0,27W/m²K. 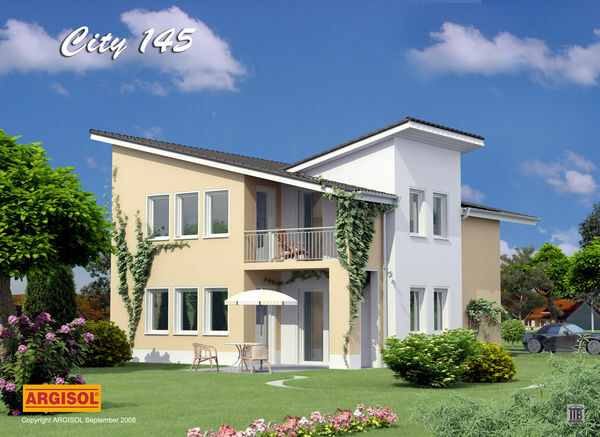 With ARGISOL® you will always get a low-energy house. By insulating the inside wall, the wall surface temperature differs only by 1°Celcius from the room temperature. As a result, there is hardly any air circulation because of temperature differences in the room. Therefore a comfortable feeling is achieved at any season of the year, summer and winter alike. Due to the solid concrete core reliable sound absorption parameter of Rw = 45 dB is achieved - a guarantee for quiet living. ARGISOL® provides optimal heat and sound insulation although the wall thickness is only 25cm. Your advantage, an increasse in living space! With an assumed floor space of 100m² about 4,5m² space is gained in comparision to a 36,5 cm wall. ARGISOL® building elements can be shortened in grids of 2,5cm with a simple saw. The diversity of ARGISOL® specials elements (corner, angle and arched stones) means they are easy to adapt to any ground-plan. The ARGISOL® building system fulfills all demands, which are addressed nowadays to a recent construction material. Certification and inspection reports confirm the technological superiority of the ARGISOL® construction system. 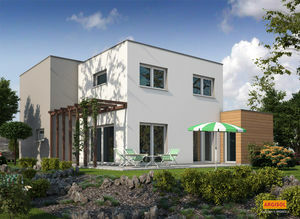 Low Energy Homes are realised by the ARGISOL® construction system with lowest possible effort. What do home-builders suspect nowadays? Energy efficient, quick and economically building! We do have your solution by the cost- and energy - efficient construction-set-home consisting of shuttering elements made of NEOPOR®. Caused by the new energy reform acts the demand for low energy homes as well as passive homes increased consiberably during the last years. At the same time the need for building methods for construction-set-homes which can be built easily also by do-it-yourselvers becomes more. Because those, who build hands-on, can easily save from foundation to roof. ARGISOL® Shuttering Elements made of NEOPOR® and Styropor® fulfill the demands on energy-efficient and competitive construction. ARGISOL® Shuttering Elements made out of Styropor® are used since 1986. The enhanced raw materials of BASF caused newly concepted shuttering elements, which then were made of NEOPOR®. The highly insulating shuttering elements made of Neopor allow fast construction and any ground plan. Find out more about shuttering elements made of NEOPOR® / Styropor® and get more informed about our huge ARGISOL® - product - range. The following pages will inform you about our innovative, future oriented construction system. Building with ARGISOL® will not let you allone - please check our services. In case you still have no precise vision, how your prospective low energy home shall look like - get inspired by our Modell Homes. Would you like to overview your expected cost of construction? Please try our Building Cost Calculator. Or may be you are more interested in technical detail solutions of our ARGISOL Building System ? Then feel free to check our Technical Chapter. You also can request a list of reference homes and our bruchures. Please fill in the contact form. After concreting process the shuttering elements made of NEOPOR® have a massive concrete core which already has an already integrated inner and outer wall insulation. Consequently the house is perfectly insulated, because the two-sided Shuttering made of NEOPOR® prevents almost all discharge of warmth to the outside. The small difference of only one degree between room air and wall surface prevents almost all movements of room air. Consequently there is a cozy feeling of living all around the year. No matter how you decide, a do-it-yourself ARGISOL® kit consisiting of NEOPOR®/Styropor® for homebuilders, including complete plans, structural calculations, thermal insulation certificate and energy certification until turn-key low energy home built of ARGISOL® Shuttering elements. It will be our pleasure to discuss with you personnally about energy efficient and economic construction with Shuttering Elements made of NEOPOR®/Styropor®. You may reach us per phone at +49(0)6359/9326-(0) or send an email to: info(at)argisol-bewa.de.